The CL listing I thought was fishy turned out much better than I thought! 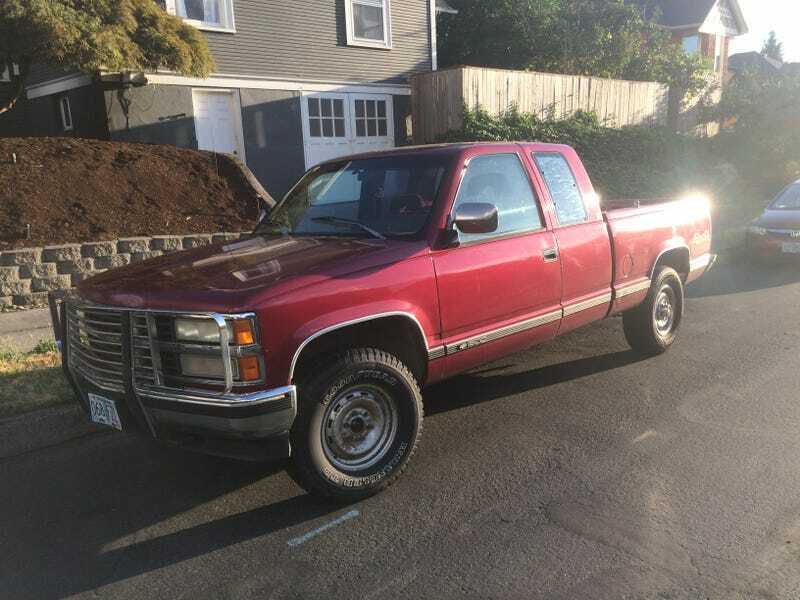 I am now the proud owner of a 1992 Chevy K1500 4x4. The truck looked quite clean for the price range, ran and drove without hiccups, I couldn’t see any obvious issues, and it has a good history — 2 owners, stack of paperwork, and just from looking at it obviously it’s been well kept up — so I offered the guy $1200 cash (really as much as I would allow myself for this) for his $1500 asking and he took it. I drove it the ~12 miles home without any big issues on the part of the vehicle or myself (it was my first time driving a manual in traffic) so I’m counting this a huge success so far. For now it’s gonna be mostly sitting for a while as I take a deeper look at things, do at least a tune-up, figure out if I can replace the suspension bushings myself, and get some tires (the ones it has are nearly bald).